American resort designer Bill Bensley is known for creating gorgeous spas for the Four Seasons, Anantara Resorts, JW Marriott Resorts, and countless other luxury hotels and resorts around the world. Spectacular design is what creates the wow factor in the Asian spa experience and when hotel owners dream of building a fabulous resort and spa, Bill Bensley’s name is spoken in admiration, followed by a sigh and a shudder at the thought of his fee. When I first met Bill he was in the midst of designing gorgeous fort palace-like resorts for Oberoi Resorts in Rajasthan, India, and he enthusiastically gave me a slide show preview after dinner in his living room of his (of course) gorgeous house in Bangkok. I first met Bill years ago while working on my first spa book. We were photographing fabulous spa locations for the book and I’d heard that Bill had a beautiful outdoor massage pavilion in his garden in Bangkok, so I gave him a call and he was happy to invite our team over to shoot in his garden. To call it a garden is an understatement. Being a Harvard-trained landscape architect and Asia’s top luxury tropical resort designer, his creativity is prolific, and it’ sobvious he practices his design ideas on his own property. What ordinary regular folks would have in thei ordinary regular garden, chez Bill, is transformed into a fantastic mini-resort, complete with dreamy water features, a lotus pond, bell tower, a Balinese dining pavilion for dinner parties, lagoon pool, massage pavilion, and a plant nursery, all nestled in a private Eden of lotuses, frangipani trees and giant ferns. Most people have a garden shed. Bill has this fabulous Balinese dining pavilion and reflecting pool. I don’t know, there may even have been more stuff like a vegetable patch and a topiary in the land behind the nursery – that’s where Bill came bursting out from the shrubbery in his jogging clothes the morning we arrived for the photo shoot (he’d just been jogging out back, he panted, before jumping into the pool to cool off). Where does he get his ideas and inspiration? Here’s a little insight from him about some of his favourite spa designs. What led you to start designing spas? The first spa we designed with my classmate Lek Bunnag was at the Four Seasons Chiang Mai. As a designer of resorts, it was a natural progression to design spas. What are some favourite spas that you’ve designed? Kirana Spa in Bali, Anantara Hua Hin Spa, and the spa at the Four Seasons Koh Samui. How is the process of designing spas different from designing hotel rooms and restaurants? The process? There is no set process. Creativity is not manufactured. 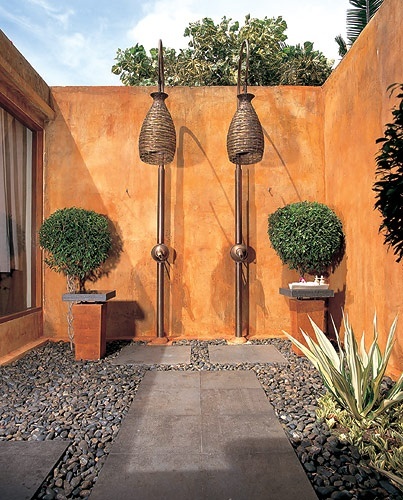 What do you consider the most important element of designing a luxury spa? Is it materials, location, budget, whatever? The single most important element of a spa is the relationship to mother nature is paramount. The guest should have the option of being outside and be perfectly private. How do you find inspiration for your design concepts? I travel 250 days per year, so I see everything that is new in our industry. Every year we go to places we have never been before. For example I went to Tibet to see the new Banyan Tree hotels there. What’s your personal favourite spa treatment? Thai massage and as hard as possible! How many hotels and spas have you designed in total now? Gosh I’ve never counted. Probably over 150, and lots more to go, as I am still young! 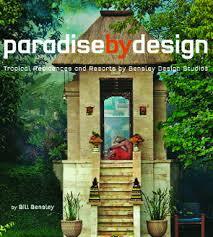 Some of Bill’s favorite hotel and spa designs are compiled in his books Paradise by Design and Tropical Paradise. 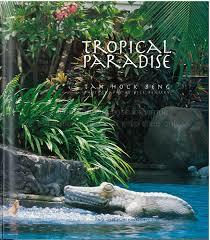 Do you love Asian tropical resort and spa design? Which are your favourites?